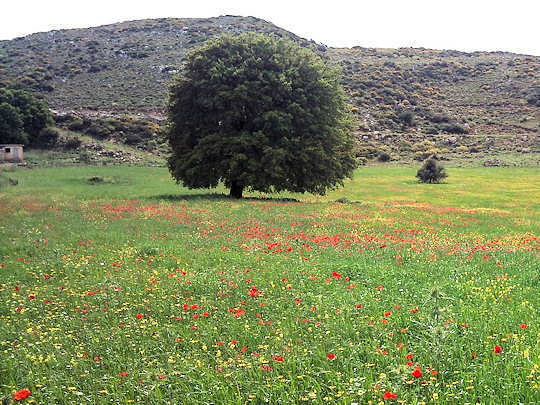 For hundreds of years, the Cretan people have been eating the wild greens abundant from their even wilder mountains. Many of the greens are often simply called horta. Many wild greens including stamnagathi exist around the Mediterranean basin, in countries such as Italy, Malta and Turkey. Although, like many plants, there is a stamnagathi that is endemic and unique to Crete. This is a sweet and bitter wild green. This sweet-bitter component is what contains its magical properties. 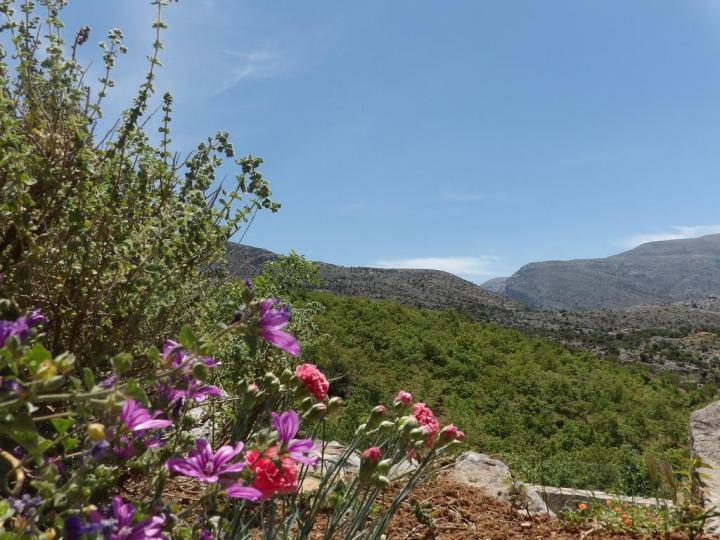 This herb in mainly found on or near the Omalos Plateau, in the White Mountains in the west of Crete. This nutrient rich Spiny Chicory is now being recognised for its many medicinal as well as culinary benefits; also being validated by science. Our stomachs are saying "told you so!". The Cichorium spinosum or Spiny chicory is a wild green that has long spiny leaves. When young these are tender and perfect for eating. 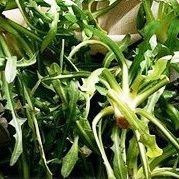 It is rich in vitamins E and C, Omega 3 fats, as well as a high concentration of calcium and iron. Eaten raw, it is ideal for the detoxification of the liver. It reduces blood glucose as well as being a strong natural diuretic. It is said to have slimming properties. Since ancient times, stamnagathi wild greens have been used as a medicine, being recognised for its antiseptic and anti-rheumatic properties. Cretans have boiled the leaves of stamnagathi as a remedy for stomach ache. Known for increasing the defence of the peptic system from various diseases, such as liver, gallbladder and kidney deficiencies. Believed to be one of the Cretan hidden keys to long life and well-being. The Cichorium spinosum ‘Spiny Chicory’ is a biennial/perennial. It grows to 20 cm in height and many times this in spread. The leaves are mid-green and basal/pinnatifid. It is hardy to zone 7. It can withstand cold temperatures. It is in flower from July to August, sometimes as late as October. The flowers are hermaphrodite (have both male and female organs) and are pollinated by bees. These are 10 to 15 mm in size. The stamnagathi is suitable for sandy, loamy and heavy clay soils, although it prefers well-drained and sandy/loamy soil. It can grow in acid, neutral and basic (alkaline) soils. It prefers moist soil. It thrives in sun, and will not grow in the shade. The plant can tolerate maritime exposure. It grows densely forming mounds up to 20 cm in height. The stems grow from the base. Traditionally the stamnagathi is found in the snowy and inaccessible parts of the mountains of Crete, as well as in some sea cliffs. Now that this had come to be known for its therapeutic properties, it is being over harvested. Grown wild, it is darker in colour. Cultivated plants are a lighter green and do not taste as bitter. Traditionally the Cretans pick the stamnagathi roots and all when not too advanced in age. They get too prickly and tough when mature for consumption. 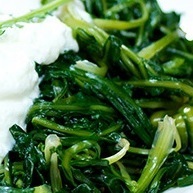 There are many different types of wild greens or horta; all of them can be used in Mediterranean cooking. Use the whole leaf and tear it gently from the stem, washing thoroughly, the soft stems can also be included, everything but the roots and flowers. Bring a pot of water to the boil. Throw in the stamnagathi just long enough to soften them. This is not even a minute. Lightly strain. Add to a bowl. Add plenty of virgin olive oil, salt to taste and lemon juice. The water in the pot can be put aside and drunk as an elixir. The stamnagathi can also be baked in pies pites. My grandmother used to make the most divine, tasty pites made with homemade wholemeal flour, a mixture of wild greens, fresh dill, a little spinach and a little anthotiri and feta. The combination of greens with the cheeses and wholemeal flour is what made these unique to most other pites. You can also use the stamnagathi wild greens in a raw salad, either rustic style with tomatoes, red onion and kritharenia paximadia barley rusk bread, and lots of olive oil. Any combination will work; a favourite is with charred and herbed octopus. The names Cichorium spinosum and stamnagathi come to us from mostly Greek origins. The ancient Greeks called chicory kichore but now use αντίδι antidi and radiki, the same word for dandelion. The Greek horticulturist Dioscrorides called the large leaf version of the plant seridos or seris. He frequently mentioned this plant for its antiseptic and its anti-rheumatic properties. Theophrastrus widely referred to a wild green calling it kichore. Stamnagathi is believed to come to us from putting two Greek words together. Agathi, which is a thorn, and stamna, which is an earthen vessel often used for carrying well water. The Spiny chicory was placed over the mouth of the vessel to stop insects going in; much like tapas was used over a glass of wine in Spain. Spinosum coming to us from latin, for spiny. During World War II, when the Germans had invaded and occupied Crete, the Cretans were found to maintain their vigour and health. In many other parts of Greece and Europe, the villagers suffered malnutrition and death due to the Germans confiscating livestock and general provisions. Scientific research has found that the Cretans main diet was wild greens, snails and what little game and fish they could keep for themselves. Professor of public health, Antonia Trichopoulou, at the University of Athens has found that the wild greens commonly used by the Cretans fulfil the daily vitamin, mineral and trace element requirements needed for health. 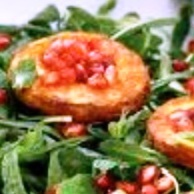 The secrets of the Mediterranean diet foods are slowly being revealed to us. My mother had a book when she was a girl that spoke of a Cretan who lived in the mountains. He lived for over 120 years. He swore that eating mostly vegetables, greens and only a little meat, and never eating till you feel full, are what contributed to his longevity. What he did not calculate was the clean air and lack of stress. Stamnagathi wild greens are now being farmed in Crete, by a horticultural enterprise ‘Cretan Gaia’ in Mires in Crete, making this an easily available green for our modern Mediterranean diet.